Debra Sue Brice has been writing for the pure joy of putting pen to paper since she was a little girl. Her life is one story after another, and the best way for her to remember it all is to bring it to life through her fictional characters. Besides writing, Debra Sue enjoys spending time with her two horses, baking and hanging out with her family. Crossing Boarders is a contemporary Christian fiction novel written by Debra Sue Brice. Dana Berrelli has been riding horses since she was five years old and working with them on the family's horse-boarding farm is exactly what she wants to do with her life. That said, she's excited, nervous and altogether thrilled to have been offered the opportunity to be a working student for the summer under the tutelage of Amy Arnot, an Olympian and World Equestrian Games medalist. Dana wants this opportunity for Indie, her beloved Hanoverian gelding, as much as she does for herself. Dana's all too aware of his tremendous potential, and her dream is for their schooling to get him even closer to the greatness and potential she sees in him. First though, she has to send him up across the Canadian border in a hired truck, and then she has to bid her family farewell for the next three months. It's hard and Dana finds herself crying as she prepares for her auto trip to the upper Ontario horse farm that will be her home for the summer. Debra Sue Brice's contemporary Christian fiction novel, Crossing Boarders, follows primary school teacher, Dana Berrelli, as she travels north into Canada and heads toward a momentous summer that might just change her future. While God is her moral compass and the ultimate guiding light of her life, Dana's world is horses. She's not all that good with people and finds herself sometimes scolding her younger roommate, Gertrude, but she's more at ease with her equine charges than just about anyone else. I loved experiencing what felt like a first-hand view of the routine a working student would follow under the tutelage of an Olympic trainer, and enjoyed seeing Dana's world expand as she leaves her family's farm for the summer and expands her horizons. And while Dana's no longer a young adult, her story is very much a coming of age tale, and, as such, it reads beautifully. Brice's own equestrian background and love of horses shine through in this authentic and well-plotted novel. It's most highly recommended. 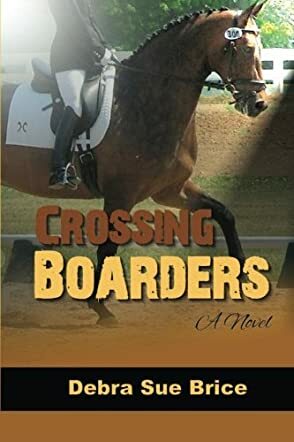 Crossing Boarders by Debra Sue Brice is about a girl’s ambition to make her name in the horse riding world. Dana always had the passion to become a quality horse rider and make a name for herself in the equestrian community. However, this is a privilege only a very few lucky people are able to enjoy. And coming from the background she does, it is nearly impossible. But she makes a very difficult decision to support her ambition, leaves her family behind, and moves to Canada to train with the Olympian Amy Arnot. Amy is tough, but she is also the best. However, this is the world of the elite. Dana tries to squelch her sarcasm, but she is finding it hard to fit in and make friends. But her dreams are about to be destroyed. A scandal awaits and if she does not do something quickly, all of her dedicated hard work might be for nothing. This is definitely a novel that I would like to share with my young nieces and nephews because it is beautiful. It contains all life’s lessons in the form of a story that grips you by the heart. The story is very easy to digest and written with great flow. The characters are strong, especially Dana. Amy Arnot is the type of teacher that I would want. I wish I'd had a teacher like that who pushed me to my limits and helped me polish my skills. This book is very well-written and extremely comforting to read, plus the cover is beautiful. Crossing Boarders is a Christian fiction novel from author Debra Sue Brice. In the intense world of equine competition, our heroine Dana does not come from the typical privileged background that most of her competitors do, but this young woman is determined not to let it stop her. Combining her faith in the Lord with her love for the sport she feels destined to pursue, Dana teams up with tough girl Amy to take on the pampered equine set. But just as she begins to mingle in their world and impress them with her talents in riding and dressage, disaster strikes. Dana’s promising career and her passion for life are about to be tested as her one big shot at glory seems to be stolen away. Debra Sue Brice has created a very specific niche in the market with this kind of fiction, but if it’s the niche you fit then it’s a definite five star read. The vivid world of equine sports is brought to life with a tender representation of the relationship between a horse and her rider. Christian values and unbending faith play a large role in this inspirational story, which is also free from cursing, graphic violence or any sexual content. Crossing Boarders is well written and flows from page to page, without unnecessary backstory and with plenty of authentic, believable dialogue from its central characters. Dana was a charming heroine with a good amount of backbone, yet a vulnerable side that readers will relate to. If you’re looking for clean Christian drama in the world of horses, this is the book for you.